In a brief e-mail to friends and associates, Australian-born winemaker Marcus Ansems announced on November 12 that he has left Therapy Vineyards to run Hemispheres Wine Guild, a new wine importing club. Marcus has been the general manager and winemaker at Therapy for the past three years, the latest stop in a varied Canadian winemaking career. Born in 1974, he comes from the Australian family that formerly owned Mount Langhi-Ghiran, the producer of one of the top Australian Shiraz wines. After getting a winemaking degree from the University of Adelaide, Marcus launched a career as one of Australia's young flying winemakers. He did crushes in South Africa, Tuscany and the Rhone before joining the Creekside winery in Ontario in 1999. In four vintages there, he took Creekside from start-up to a rising star. 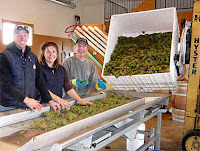 He also handled the turnaround of Creekside's sister winery in Nova Scotia. He returned briefly to Australia but was back in Canada in 2004, this time as the winemaker at Blasted Church in the Okanagan. He moved to Therapy the following year when it was starting up. As he left, the winery had just completed its 2008 crush, producing about 11,500 cases. In a matter of weeks, production moves into a new $2 million winery on Therapy's Naramata site. 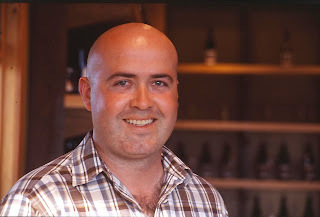 The successor in Therapy's Cellar is Steve Latchford, a winemaker who has worked with the Jackson-Triggs winery in Niagara and recently with the Holman-Lang group of wineries in the Okanagan. In his e-mail, Marcus that his new project "will allow me to travel to interesting wine regions with my family and bring back wine [for our members] not currently available in Canada." He is president of Hemisphere Wine Club, which describes itself as a subscription-based co-operative. It is currently soliciting for members through its website, www.hemisphereswine.ca. For a $500 initiation fee (waived until January 1, 2009) and either monthly or annual payments, members will get quarterly shipments of imported wines chosen for them by Marcus. The quantities vary between eight and 16 cases a year, depending on what members sign up for. Level one members (eight cases a year) pay either $209 a month of $2,500 a year. Level two members get 12 cases a year for $334 a month. Level three members (16 cases a year, four of which are ultra-premium and another four are icon wines) pay $500 a month or $6,000 a year. The approximate model appears to be the Opimian Society, a wine club that was launched in 1973 and now claims a national membership of 18,000. The original general partner of the investor group that started Therapy Vineyards, John McBean, ran the Opimian Society in southern Alberta for many years. McBean and Therapy parted company this summer after an acrimonious dispute among the investors. Ann Sperling, one of the finest of Kelowna-born winemakers, made wine this fall in the Okanagan for the first time in 13 years. Currently based in the Niagara Peninsula, Ann and Peter Gamble, her winemaker husband, are spearheading her family’s new Sperling Vineyards Winery in Kelowna. At the same time, they are winemakers for Camelot Vineyards, another new Kelowna winery. Both wineries expect to be open in the summer of 2009. The Sperling winery completes the circle of history. Through her mother, Ann is a member of the Casorso family that planted the first vineyard in the Kelowna area in 1925. The East Kelowna vineyard that supplied grapes for the new winery is on Casorso Road. The first vines were planted here in 1930 by Napoleon Peter (Pete) Casorso, Ann’s grandfather. When he retired in 1960, the vineyard was taken over by his daughter Velma and her husband, Bert Sperling, who are Ann’s parents. Peter Gamble started his winemaking career at Hillebrand Estates Winery and ran the Ontario VQA program for a number of years. Over the past decade, he has consulted on the launch of several leading Niagara wineries including Stratus. Currently, he and Ann are the consulting winemakers for Benjamin Bridge, a sparkling wine project in Nova Scotia. They also own a seven-acre vineyard of 1920s-era Malbec vines near Mendoza in Argentina and are working with a winemaker there to make premium wines. This summer, the family agreed to move ahead at long last with a small premium winery to complete the Casorso legacy. The partners in the project are Ann’s parents; her oldest sister Susan and brother-in-law Paul Richardson; and Ann and Peter Gamble. The Casorso legacy is remarkable. It began when Giovanni Casorso (Ann’s great grandfather) arrived from Italy as an agriculturist with Father Pandosy’s Oblate Mission. One of his sons, Charles, planted the first vineyard in the Kelowna area in 1925. Two other sons, Pete and Louis, planted vines five years later on the Casorso Road property (as the street was named years later). Rosa, Ann’s great grandmother, was the single largest investor in the consortium that launched in 1931 what later became the Calona winery. Subsequently, the Capozzi family acquired control but Pete remained a shareholder in Calona well into the 1960s. Today, the 45-acre Sperling Vineyard, which sells its fruit to Mission Hill, includes a 45-year-old planting of Maréchal Foch, a 35-year-old planting of Riesling and another old planting of Perle of Csaba (a Muscat variety), along with Gewürztraminer and Pinot Gris. There are recently planted blocks of Pinot Noir and Chardonnay to support the production of premium sparkling wine. This vintage, Ann and Peter shuttled alternatively between winemaking duties in Ontario and Kelowna. They have produced about 600 cases for Sperling Vineyards (some grapes still hang for icewine) and about 400 cases for Camelot, all of it done this fall in the Camelot winery, located a five-minute drive from the Sperling vineyard. Camelot is owned by Rob Young and Denise Brass, two Air Canada flight attendants who have lived on an East Kelowna apple orchard for several years. Two years ago, they replaced the trees with vines and erected a winery. Then serendipity came into play. They needed a winemaker and learned that Ann and Peter needed a facility in which to make the Sperling wines because Sperling has not yet applied for a licence. The Camelot winery was the ideal facility for Sperling’s first vintage. Ann and Peter also signed a three-year agreement to make Camelot’s wines. This winter, the Sperling family plans to get a winery licence for the Pioneer Country Market, the busy restaurant, market and deli that Velma Sperling as run for years on Kelowna’s Benvoulin Road. In yet another closing of the circle, the market is just down the road from the Pandosy Mission where Giovanni Casorso got his start in the Okanagan. A second surprise has emerged from the Naramata Bench’s Hillside Estate Winery. The new winemaker is Kathy Malone, recruited from the cellars of Mission Hill Family Estate Winery. She takes the place of Kelly Symonds. As I reported in this blog last month, Kelly is moving to California Cult Classics in North Vancouver, a super-premium U-Vin that works with California grapes. Kathy is a long-time Mission Hill veteran and has had substantial responsibility for making many of Mission Hill’s best-selling wines. Her move to Hillside is said to be prompted by a desire to work a small winery environment. How good is Kathy? Put it this way: John Simes, Mission Hill’s senior winemaker, is advertising for two winemakers to replace her. One position is for a “commercial” winemaker to deal with the non-VQA wines that are made with imported wines. The other is for a winemaker to take over production of Mission Hill’s growing range of small lot wines, such as the just released Quatrain (red blend) and the Perpetua Chardonnay. Wade Stark, who has worked with Kathy for the last 10 years, looks after the bulk of the VQA portfolio, including the Prospect Winery products. In the week that Mission Hill has advertised the positions, the winery has received more than 50 resumes, including applications from France, from Italy, from Napa and Australia. According to Simes, some of the resumes are quite impressive.